Nestled in a quiet nook of the Walla Walla airport, Hidden Valley Bakery provides a peaceful respite from the hustle and bustle of the airport. The Paige family, who have owned the bakery for 16 years, aims to provide a home-away-from-home for their customers. 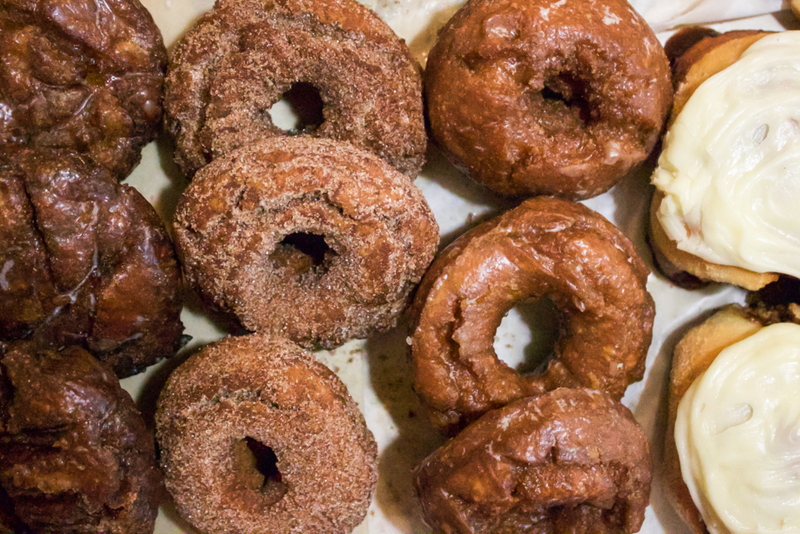 In order to cater to people with different dietary needs, five years ago bakery manager Gilda Paige decided to incorporate gluten-free foods into the bakery’s menu. Looking at the bakery’s kitchen is like seeing double. The bakery itself is split in two, with Paige’s gluten-free kitchen on one side and her husband’s kitchen, which utilizes gluten, on the other. From knives to microwaves, every piece of equipment that isn’t already separated by the two distinct kitchens comes in a pair, one tool designated for foods containing gluten and the other tool for gluten-free foods. “If you can show your customers the precautions that you take, they’ll go and feel more at ease to sit down and have a meal there,” Paige said. “If you can’t do it correctly, don’t do it at all.” Even within her blends, Paige exercises extreme caution by making everything by hand. “Once wheat has touched [a kitchen utensil], it’s in there,” Paige said. While gluten-free baking requires meticulous organization, Paige has inspiration to continue her work. According to Paige business has increased since moving to the airport last May from down the street. While the airport is typically a place to pass through, Hidden Valley Bakery has become a destination for its base of dedicated customers. Hidden Valley consistently tries to treat each customer with friendliness and warmth and constantly strives to build new relationships. Paige remarks that, “Everyone always comes and looks up and says, ‘Oh no, gluten-free!’ But you know what? No one even knows that our stuff is gluten-free [when they taste it].” So it truly caters to the entire community–just what the Paige family aims to do. Visit Hidden Valley Bakery Monday-Friday 6:30 a.m. – 5:30 p.m. and Saturday 6:30 a.m. – 3:00 p.m.
Fine-ly Made, which offers exclusively gluten-free and vegan products (many of which are also soy-free and nut-free), was born out of King’s own diagnosis of Celiac disease with a dairy and egg intolerance six years ago. As a self-described “foodie” and “mad scientist” in the kitchen, after learning of her allergies King started with bread and later tackled cookies, muffins and cakes. 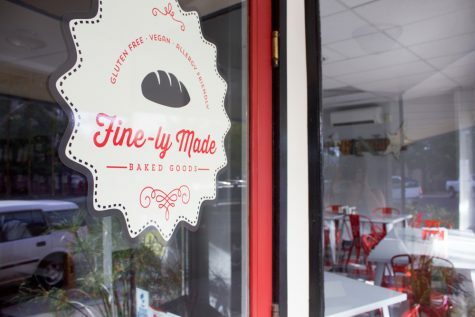 Fine-ly Made’s products range from muffins, granola, breads and vegan and soy-free cheeses to, most recently, a lunch menu that includes salads, sandwiches and wraps. By offering so many options for those on restricted diets, King sees her bakery as filling an important role in the Walla Walla community. Fine-ly Made’s new spot at 23 South Spokane near Allegro Cyclery officially opened July 18. The bakery’s relocation, that took place nearly three years after the opening of its former site in College Place, marks not just a change in address but in function. In addition to seating that can comfortably hold about 30 people (compared to the old location’s one table), the bakery’s Spokane St. location heralds more breakfast choices, a full lunch menu, coffee and tea, free wifi, the option to dine in and for Whitman College students, a five percent discount on “Whitman Wednesdays.” The move closer to Whitman’s campus reflects King’s focus on attracting more Whitman students, many of whom may already enjoy her baked-goods through the gluten free section provided by Bon Appétite in each dining hall. Fine-ly Made products can also be found at eight businesses in Walla Walla, including Maple Counter Cafe, Wingman Birdz and Brewz and Mill Creek Brew Pub. Despite its focus on vegan and gluten-free foods, King said her customers encompass a wide spectrum of people. Some have gluten or dairy intolerances, some follow vegan or vegetarian diets and others simply appreciate King’s focus on “the highest quality ingredients.” King explained, “I’m super careful and intentional on every single thing that I pick.” For instance, King buys only super-fine flours to prevent a gritty texture, avoids GMOs and MSG and buys organic when possible. King attributed the increasing popularity of people avoiding gluten to “people…becoming more and more aware” that diet directly impacts health. Even if people do not have gluten allergies, King’s products eliminate many of the unwholesome ingredients found in popular wheat breads, such as dough conditioners, low grade wheat, corn syrup and preservatives. “Keeping the food as clean as you can possibly keep it is huge,” King added. Visit Fine-ly Made Baked Goods at 23 S Spokane Monday through Friday, 8:30 a.m. to 4 p.m.
Jane Kern, a Junior at Whitman College, was diagnosed with Celiac disease seven years ago. However, the increased awareness of gluten intolerance and the popularity of gluten-free foods in mainstream culture has led companies to create more and tastier products. “There is bread that actually tastes like bread…I had toast the other night for the first time in three years,” Kern said. To make up for the carbohydrates she can’t eat through bread, pasta and other wheat-based items, Kern chooses rice, potatoes and corn, instead. Being gluten-free means that Kern must use alternative ingredients while cooking. For example, she uses bean flour instead of wheat flour when making brownies. In Whitman’s dining halls, Bon Appétite places signs that say “gluten” with an arrow pointing down next to food to indicate low gluten because they’re not completely gluten-free kitchens. “There’s only been one time where they messed up and labeled something wrong…I didn’t realize that orzo was pasta instead of rice, so it was both of us,” Kern said. 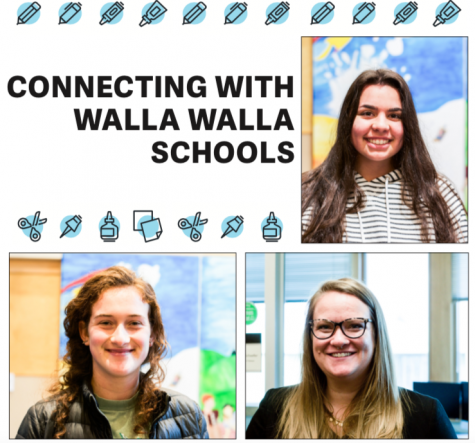 During Kern’s first year at Whitman, she enjoyed eating at a gluten-free cafe in Walla Walla called the “Green Spoon;” however, it went out of business last year. Kern is an advocate for both Hidden Valley and Finely Made products, but also noted that Safeway provides a nice selection. 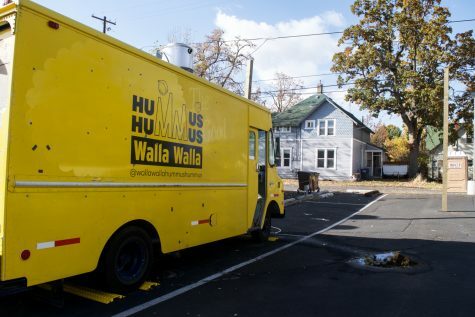 In Walla Walla, some of her favorite foods are Sweet Basil’s gluten-free pizzas and the gluten-free Thai dishes at Phoumy’s Thai Cuisine. Being gluten-free has impacted parts of her life that many would not even begin to consider. Katharine Dolan, a first year at Whitman College, learned of her gluten intolerance at the end of her first year of high school. While Kern has Celiac disease, an autoimmune response to gluten, Dolan lacks the enzymes needed to digest gluten. While deciding where to attend college last year, one of her considerations was whether or not she would be able to find things to eat. Whitman passed the test. Even on Dolan’s Scramble, a week-long trip in the backcountry of Washington led by Whitman students, her leaders brought gluten free pizza dough to accommodate Dolan. Last week, Dolan walked to Fine-ly Made to get a peanut butter crunch bar. She noted that it is not necessary to buy foods made and marketed as exclusively gluten-free. “Things that are specifically made gluten-free are more expensive, but if you just eat things that are just naturally gluten-free like rice or oatmeal, it’s not more expensive,” she said. Contrary to popular belief, being gluten-free is not all bad.